What is Edamame? Since Edamame has become popular appetizer in Japanese restaurant everywhere in the world over the past decade, I get asked questions like “What is edamame?” all the time. I love edamame and I cook it all the time, but I didn’t know enough to answer those questions before. It looks nutritious. It looks like beans. But what kind of beans are they? So, I studied a little and learned that edamame is an amazing food! 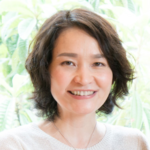 This is a fact that many Japanese don’t know either. They consider edamame as a name for the plant. But, no. They are soybeans. They are young green soybeans. Soybeans are edible through their lifecycle. You can eat it as sprouts. In English, it is called soybean sprouts. So, you know they are baby soybeans. But it is not so obvious in Japanese since it is called “moyashi”. It sounds totally different from “daizu”, which is the term for soybeans in Japanese. So, you may be surprised that many Japanese don’t realize they are eating soybeans when they eat the sprouts. Anyway, Soybean sprouts look less nutritious since the color is whitish, but they are actually rich in folic acid, calcium, potassium and fiber. They are white since they are grown in a dark room. When they are grown in sun light, they stay green and grow into soybean plant. When you harvest them while they are still green, you can eat them as Edamame. If you leave them to dry and turn into brownish crop, they you get soybeans that are used to make tofu, miso, soy sauce, natto and other soy products. For the detail about soybean products, you can read my post about soy products. Take a look at this comparison of edamame and dry soybeans I made. It may trick your eyes since it looks as if soybeans have a lot more nutrition. But you won’t be eating 100 gram of dry soybeans in one go. 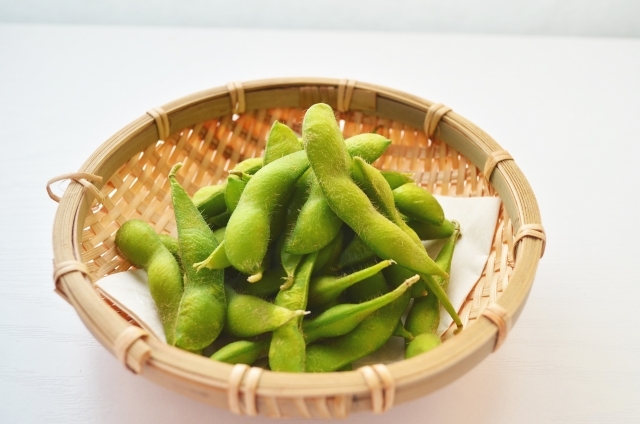 Edamame is rich in protein, calcium, fiber and iron. It even contain Vitamin C and beta-carotene that dry soybeans don’t have! It’s a veggy with all the other nutrition soybeans offer. This green veggy also contains great amount of potassium that has mild diuretic effect. It helps you by getting rid of excess salt and water from your body. The other thing Edamame contains is an essential amid acid called methionine. It helps alcohol decomposition. 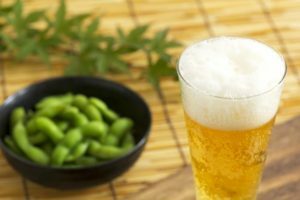 No wonder edamame is one of the most popular nibbles to go along with beer in Japan. But methionine offers more than that. It actually helps you burn your body fat. You’ve heard of L-carnitine, the substance that promotes burning of body fat. L-carnitine is a popular ingredient of diet supplement for weight loss. Methionine is a precursor of L-carnitine. Your body uses methionine to produce L-carnitine. L-carnitine is required for effective body fat consumption, but your body produces less amount of it as you get older. Methionine cannot be produced inside of your body, so you have to take it from food. To sum up, edamame is very nutritious and good for you! By the way, I am growing edamame on my balcony this year. I can’t wait to harvest it! Put it in the boiling water. Careful not to overcook. I always drain them after 1 1/2 minutes (2 min for frozen edamame). Sprinkle some salt and serve. Hope this information helps! Let me know if you have any questions.